Tulips are truly a breath of fresh air-like taking in the fragrance of sheets off the clothesline. For early spring color and sheer garden abundance, nothing beats a bed of willowy tulips in full bloom. 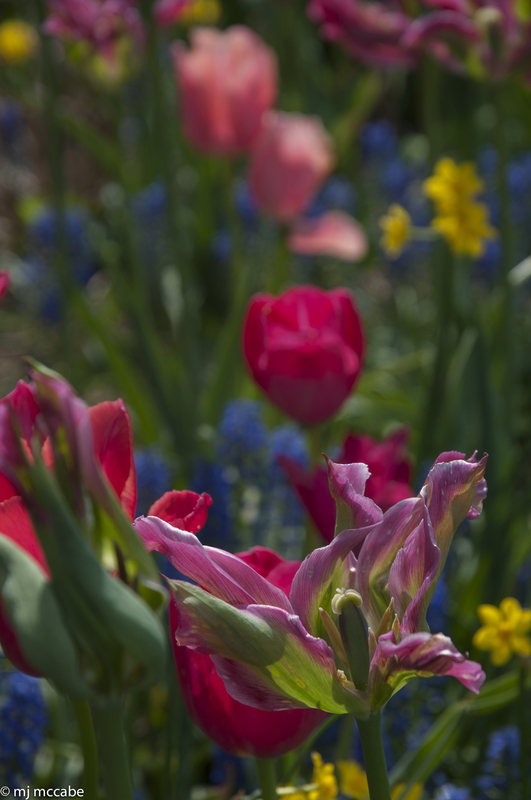 A sea of tulips will certainly lift your spirits after any lingering grey of winter. Generally, tulip varieties are divided into 15 different groups which categorizes them by bloom time and overall shape and form. Very early blooming and low growing, the greigii and kaufmanniana varieties are a great addition to your early spring garden. Species or wild tulips are smaller and more delicate in form-often the colors are quite vivid in hues of red or yellow. they tend to be easier to establish in the garden as they are somewhat less resistant to rodent damage. Once established in well-drained soil, they multiply and rebloom each spring. Some reliable varieties to try are: sylvestris, clusiana, humilis, saxatilis and dasystemon. These are perfect for planting near doorways and rock gardens as they are the first to bloom in early spring.